The aim of becoming the best tubular heater elements suppliers is only possible when customers get satisfied with our quality products. Being certified ISO 9001:2000, our outstanding products continue to meet customer satisfaction every time. No spare parts needed which involves low Maintenance cost. Processing of fiber products or particulate: Based on the percentage. shape, and size of the fluids, the inner diameter of a heat exchanger is chosen. High working temperature and pressure: Pressures may exceed 100 bar in mechanically-driven industries whereas high operation at maximum as well as minimum temperatures is possible with tubular heat exchangers. High security ensured in aseptic processes: No leakage while transferring the fluids. Tubular heat exchangers have met the need of the industries for huge processes. The number of heat exchangers usage varies based on industry and product manufacturing. For industries such as pharmaceuticals, Chhaperia is on its wings to supply the heat exchangers. The crucial elements to industries are tubular heat exchangers. 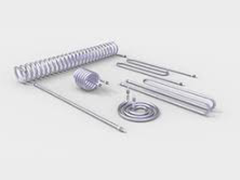 Operating for more than three decades, Chhaperia placed its leg in the international market, and its quality-delivery made it be the best tubular heater elements suppliers.